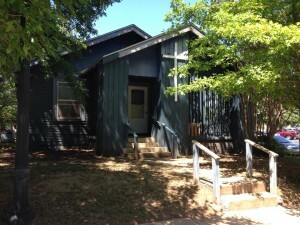 The Little Blue House was built in the 1960s and has housed our campus ministry since 1967. Originally a two bedroom house, it was converted into a workspace through several modifications of all shapes and sizes. As the building is fairly old, it is in need of updating and some repair. We are also working towards being ADA compliant! As such, we have an ongoing list of needed items and maintenance requests for which we kindly ask your assistance. If you would like to donate or purchase the items for us, please contact linda-davis@utulsa.edu, make an online donation, or visit our lists and purchase online. Amazon items will be shipped directly to us! Remember to sign-in to your Amazon Smile account when shopping and choose us* as your charity! *Our name on the Amazon Smile account is United Ministry at the University of Tulsa.